Last night was an epic night of gaming for me. The wife was out at a Kentucky Derby party and I had access to a babysitter, so it turned out that I got to game it up from 9PM until 3AM, so if my writing isn’t up to the usual muster, please understand that going to sleep at 4AM and being awakened at 7AM by my 19-month old can put a world of hurt on you. Last night we started, and ended, the night with several games of Irondale, a new addition to Small Box Games’ latest lineup, the Pure Card Line. As the name suggests, these games are entirely composed of a box, some cards, and a standard sheet of paper, folded to fit in the box, which serves as a rules book. Now, I have complained before about some of John Clowdus’ rules being less than easy to read, but Irondale has completely gone against that idiom and was incredibly simple to understand. It’s not that he intentionally tries to make the rules tough, but that being said, it’s hard to put a huge, complex set of rules onto one double-sided 8.5×11 sheet of paper, and his games are generally anything but simple. This time, as I said, he hit it out of the park, making a deep game that is explainable using only that one sheet of paper. That the game rocks is not surprising, as most Small Box Games do, but that every member of my Friday Game Group was giving it high marks and asking to play it a fifth time instead of playing a game of Castle Panic, was. It was an instant hit, and with the various opinions that my rather diverse group has, it was quite high praise to have them all, unanimously, wanting to play it again. Irondale is a card game that has players drawing building cards and playing them to the city, a la Carcassonne, expanding the city and earning victory points based upon how, and where, you play each building. Every card has unique powers that affect adjacent buildings, and many are contentious in that when played you can steal other players’ cards, force them to discard, and other backstabbery. It’s simply a fun way to spend a half an hour or so if you like medium-weight card games. The game’s components, as noted, are all cards, so I will describe them instead of the usual in-depth review I customarily provide. The cards are of three distinct backing types: blue, green, and brown, which are stacked in the draw area. The major difference between these stacks is that one set has a back on it with values of one through four, another has five through eight, and the last has values of nine through twelve. These are used to keep track of scoring during the game, and if you have more than twelve points you simply draw a new card and set it next to the first scoring card, adding the two to get your total points. The art, while not incredibly appealing to me, was passable and the icons made a lot of sense, were different and easy to discern from one another. All things considered, the game certainly will not win any awards for the artistic aspect of the card design, but it surely might win an award for the overall game design once you understand what a well thought out game it is. Setup takes about one minute, literally. You simply place 4 cards from the blue deck face up in the center of the table, as described and illustrated in the rules, then the first player takes four cards from the decks to begin. 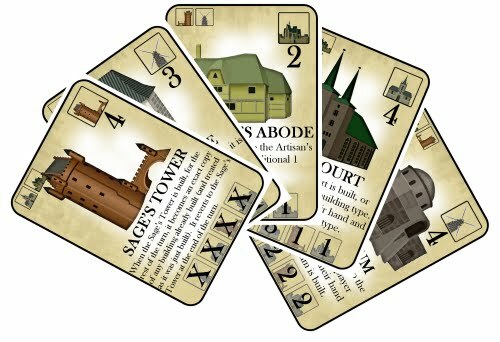 The gameplay is rather simple, in theory: each card has a building type, one of four, and has a build cost that indicates how many cards you have to have in your hand at the time of placement to place the building within the city. You can normally place two cards within the city on your turn; one anywhere you wish, provided it’s adjacent to an existing building, and the second must be placed adjacent to the building you just placed, with some exception. It’s a very simple game, on its face, but when you look into the scoring and card acquisition mechanics the game becomes far deeper and more interesting. There is a scoring guide at the bottom of each card that indicates how many points are earned by placing the card adjacent to each building type, and thus retaining a key card to play at a later time and planning preceding moves around it is critical to success. Furthermore, there are only a few ways to get new cards: You may buy cards at the beginning of your turn by spending your scored points, you can draw cards due to placing certain buildings and next to certain buildings, and finally, there are cards that allow you to mercilessly pilfer cards from your opponents. The final scoring aspect is that each card has two building types listed in the upper left corner, and this is the Master Plan. If, on your turn, you can place both building types, you may then reveal the card with the Master plan for 2 bonus points, 2 bonus cards, or a combination thereof. 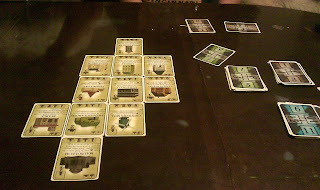 There is a hand limit of five cards for all players, and so the entire game can be played by hanging back, quietly trying to prepare the city for a big scoring round where you jump into the lead. 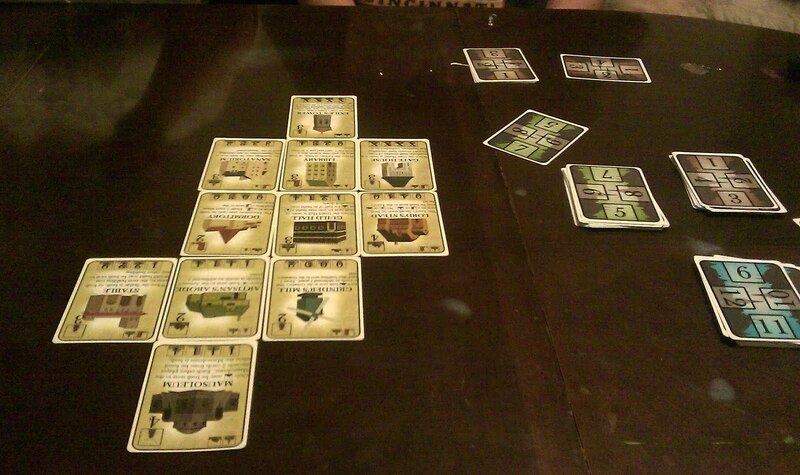 The game ends when a specific number of buildings occupy the city, with this varying depending upon the number of of participants. After the threshold has been met, everyone gets one last turn, and the player with the highest score wins, unless there’s a tie, in which case the player with the largest amount of cards still in hand wins. At the end of the day, this is a fun game that takes literally 5 minutes to teach a group, but I can see it taking many, many moons to truly master. The good news is that it’s enjoyable enough to want to take the time to do so. If you like tile-laying games like Carcassonne but don’t want to screw around with calculating farmer scores, this is a great alternative. In a lot of ways, especially regarding the multifaceted, deep scoring options, I believe this game to actually be superior to Carcassonne and Settlers of Catan. I would even go so far as to call this a gateway game, provided you are playing with someone with a reasonable amount of intelligence. Check it out, it’s sure to impress you. Alright, you sold me on it right there.